Ki Charter Academy (Ki), located in San Marcos, is the largest residential treatment center (RTC) for children in Texas. Approximately 200 students reside at the center at any given time. While the RTC addresses treatment needs, Ki provides an education to the students. Ki Charter is the first of its kind in the nation to offer students STEM curriculum and access to a state of the art science/technology lab. Ki is receiving recognition for their innovative methods to learning using various kinesthetic desking options within the classroom. The Ki administration team spent many hours developing their ideal school. Based on their experience and research on kinesthetic learning environments, the team decided to employ various options within each classroom including stand-biased desks by Stand2Learn. For those unfamiliar with the concept, kinesthetic learners are students who learn best through acting, doing, touching, and experiencing a concept. This is in contrast with visual learners, who can learn from charts, videos, and written instructions, or auditory learners, who engage well with audible instruction. When you hear the phrase ‘thinking on your feet,’ you probably do not realize how accurate it really is. Research has shown improved cognition, engagement, and focus from people who stand versus sitting throughout the day, including students. This makes a strong argument for the adoption of standing desks in the classroom to increase student engagement. There’s also a strong argument in favor of standings desk benefits that stem from a freedom of movement in students. Many struggle to stay seated for seven or more hours per day, fidgeting and fussing in their seats. Allowing them to stand, move around, and engage their bodies more removes the distraction of that unreleased energy from the equation. The partial elimination of certain disruptive behaviors may also play a role in explaining why standing desks show the improvements they do in students. Excess energy in a single student can quickly become a distraction for the entire class. Even worse, such disruption can require direct teacher intervention, cutting directly into educational time. It’s no surprise, therefore, that something which can help relieve the valve to some degree can show a remarkable impact. Now, let’s look at what that 15 percent engagement means in practical terms. For a typical class schedule, this equates to roughly nine minutes of additional engagement in the classroom. Over the course of a school day, this adds up to nearly an entire hour of focus. Over the course of a school year, you’re looking at 9000 minutes of engagement, an entire 150 hours of additional engagement. With all this in mind, it’s easy to see why some educational experts are already recommending the move to standing desks. There’s very little to lose, and quite a bit to gain. Philip Muzzy contacted Stand2Learn in 2014 with the Ki Charter school concept. We were honored to be part of this innovative learning environment and loved being part of the conceptual process. The Ki Charter team had an amazing vision and are now providing exceptional structure for students with diverse learning needs. 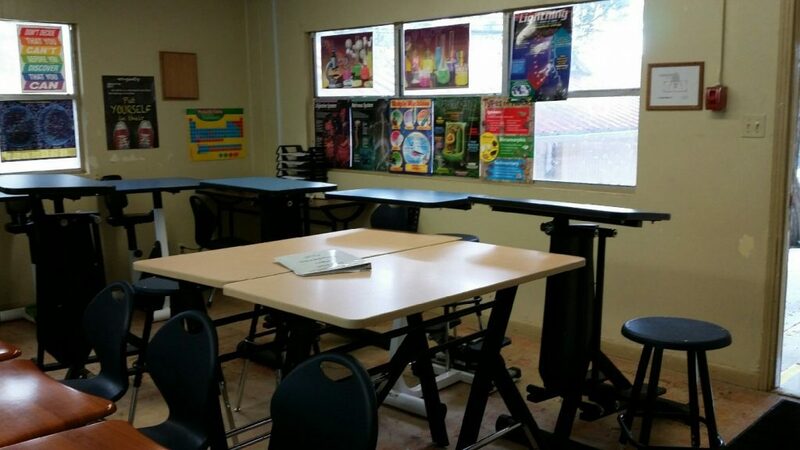 “Students enjoy the choice in seating, in particular the Stand2Learn desks. It give them an opportunity to move, stand and sit while still fully engaged in the classroom instruction,” said Christopher Allison, Director of Operations at Ki Charter Academy. Dr. Benden’s research began to highlight the ergonomic advantages of standing and movement in the office environment as early as 2001, long before standing desks became popular. As a commissioned Officer in the Unites States Army Reserves, and in a civilian Ergonomic Engineering career culminating as an Executive VP for an Ergonomic Product manufacturer, Dr. Benden has seen firsthand the impact of his research. He is currently serving as the Director of the Ergonomics Center at Texas A&M where his groundbreaking research continues. Stand2Learn draws insights from his published research to provide educational solutions that fit children and adults of all sizes. His work with biometrics and biomechanical precision behind the scenes combined with research and years of industry experience is why these innovative solutions feel so natural.